My husband and I used to frequent a restaurant years ago that served a wonderful chopped salad before dinner. While it tasted fabulous, there really wasn’t anything special about it, but I loved how easy it was to devour. Eating a salad at a restaurant can be a less than graceful affair. A large chunk of lettuce or big wedge of tomato causes you to open your mouth wider than usual, which of course is never nice in public. Then you have a giant bulge inside your mouth protruding from your cheeks, what I like to call the squirrel affect. Not a pretty sight. Hence my love for the chopped salad. A couple months ago I was contacted by Bailey’s Irish Cream. They told me of this fun concept they had called Friendsgiving. Everyone knows that Thanksgiving is reserved for family, but why not celebrate on another day with your close friends? Hence the idea behind a Friendsgiving celebration. 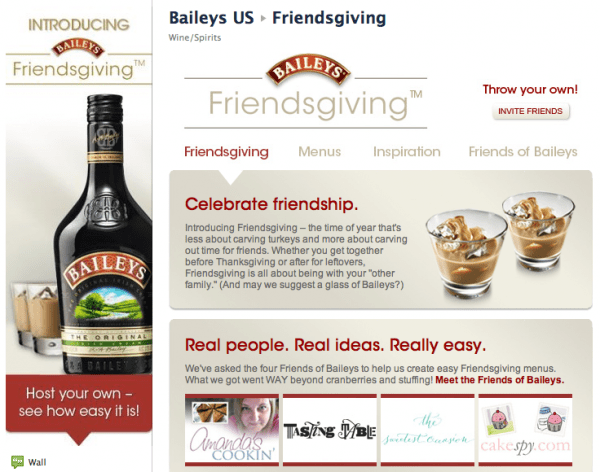 Bailey’s asked me and a few other bloggers to host our own Friendsgiving get togethers. To invite a few close friends over and prepare a meal and simply enjoy their company, and give thanks for the friends in my life. I live in a rural community, and due to my work online, I don’t “get out much”. So when first approached I thought it would be a great opportunity to hang out with a few friends to eat, drink and be merry! This is really a great concept, so be sure to check out Bailey’s Friendsgiving Facebook page for more ideas. Share your ideas on their wall too, they love hearing from their fans! Over the next few days I will share with you my menu for the Formaro Friendsgiving. Hence, the chopped salad I started telling you about earlier. When asked to come up with a menu I built mine around an Italian-American theme. I’m certain that a traditional Italian meal would start with an antipasto, but in the Italian-American meal it’s common to start with salad. Chopped salad is so versatile, you can adapt it to include your favorite vegetables, fruits and nuts. The version I’ll share with you here is all vegetables, though I would normally add some chopped pecans as well. One of my guests has a nut allergy, so they were let out this time. Be sure to include colorful vegetables such as yellow or orange bell peppers, radishes, and tomatoes. You can add your favorites or substitute anything you like to make it your own. 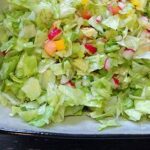 To make things easy, lightly toss this salad with your favorite bottled Caesar vinaigrette rather than serving separate dressings. Just use enough dressing to add flavor, do not drown your fresh produce! Serve extra dressing on the side so that guests can add more if they like. Remove core from lettuce* and first outer layer of leaves. Cut head of lettuce in half and slice each half into thin strips. 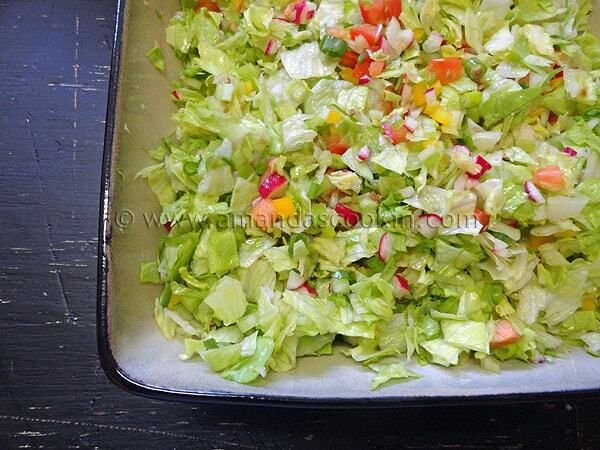 Dice the thin strips and add diced lettuce to a large serving bowl. Dice radishes, celery, bell pepper, scallions, cucumber and tomatoes. Toss into diced lettuce. 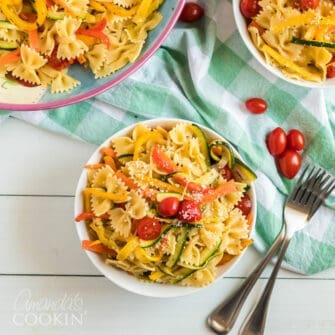 Drizzle a couple of tablespoons onto the salad and toss well. Do not drench the salad, just add enough to flavor it. You can serve additional dressing on the side. *To easily remove the core, hold head of lettuce in your hand with the core facing downward. Firmly bang the head of lettuce onto the counter so that the core is what hits. Lift head of lettuce, turn it over and simply pull the loosened core out and discard. While Bailey’s Irish Cream did compensate me for the time I spent developing these recipes and celebrating this concept, all opinions and viewpoints are 100% mine. So cool that you are doing this with Bailey’s love that stuff. 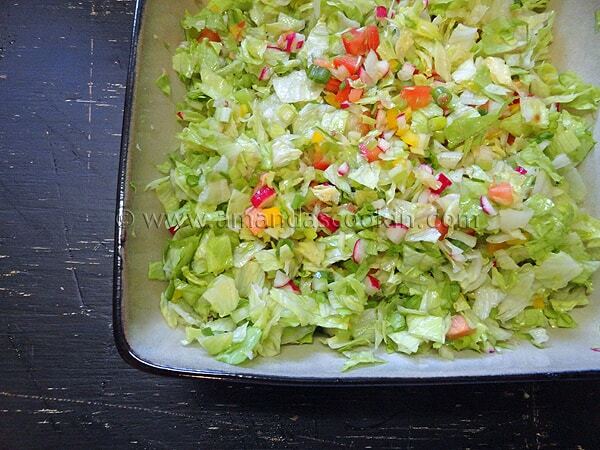 Chopped salad is great. .
Oh your chopped salad brought back an old fond memory. My best friends grandmother,(this is going back many years) had invited me to dinner for the first time. When she placed the salad on the table, it was chopped in small pieces just like your photo. I’d never seen a salad chopped so small, but after eating the salad without looking like the usual slop I did, trying to eat large slippery lettuce leaves, I wondered why everyone wasn’t serving salad that way! My mom and I agree with you about salads in restaurants not having the veggies chopped small enough. Love the friendsgiving idea! I think we should do this once a month. Is it wrong that I think I might enjoy Friendsgiving more than my regular family Thanksgiving? And you’re totally right about chopped salads…I hate eating salads in public because of how messy they are. Huge lettuce, large of chunks of tomato…awkward.